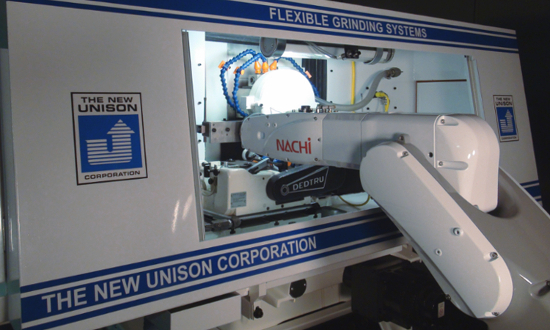 Unison Corporation offers a complete line of standard and custom-made grinding machines. Our products feature both manual and computer controlled CNC equipment. We are one of the leading designers & builders of high precision grinders and are recognized worldwide for our expertise in the field of grinding. Unison was founded in 1959 and designed the patent to the DedTru® Centerless Grinding Fixture. During the 70's, Unison was one of the pioneers in the field of computer controlled grinding equipment. In fact, in 1976, we installed the first computer on a grinding machine which was the genesis of our TruFlute® line of equipment. Our early experience with computer controls established a base of knowledge which evolved into our proprietary state-of-the-art computer control known as the Unison Programmable Controller (UPC). Today, the UPC is used in all of our CNC machines together with our user friendly software with its real-time graphic three dimensional (3D) parts simulator. Unison continuously invests in research & development to discover new methods for solving grinding problems. Our efforts have resulted in the development of extremely accurate grinding machines which produce round parts, helical fluted tools, rotary files, burrs, end mills, ID/OD round and non-round profile tools.